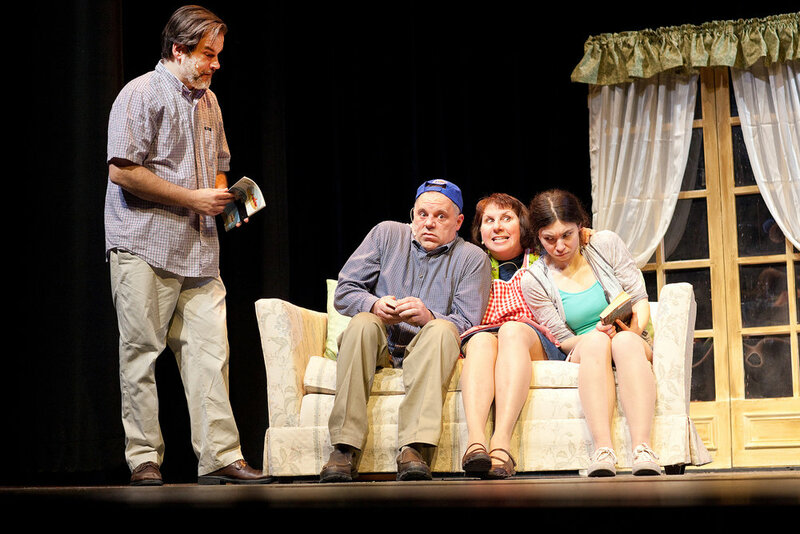 “Leaving Iowa,” presented by Falls Patio Players, will prompt audience members to fondly recall family road trips. There are the usual clichés of kids fighting in the back seat and teasing parents mercilessly to stop somewhere. But this show, directed by Brian Zelinski, adds another layer, cleverly jockeys between past and present with a poignant story of the imprint parents leave on their children. Even though it may not feel like bonding at the time, the trips leave lasting memories, as this story reveals. The show starts in the past, with the Browning family on a road trip. Dad (Jim Mallman), a teacher, is clearly lost, but is cool about it. The show goes back to that point toward the end for a touching finale. After the opening scene, “Leaving Iowa” moves to the present. The kids are adults now and celebrating a birthday. Son Don, a writer living in Boston, still feels guilty about not appearing at his dad’s retirement party, even after his dad has died. On this day, he, his sister (Alexa Laur) and mom (Karen McKinney) decide to give dad’s ashes, which have been unceremoniously stored in the cellar “behind the peaches,” a more fitting resting place. Don agrees to take the urn and scatter the ashes around his grandparents’ former home, a frequent destination on family travels, several hours away. Don talks to his dad’s ashes in the car on his journey, recalling various family trips that then are reenacted in flashbacks on stage. Like the adventures on his family vacations, Don’s trip to his grandparents home provide more than a few surprises. We learn a lot about Dad and Don on these trips – Dad’s obsession with learning, his dislike of RVs on the road (“We have a home. Do we slap wheels on it and drive all over the country?”), his back seat driving while Mom’s at the wheel. Sis is always getting Don in trouble in the back in some of the show’s most hilarious scenes. Aunt Phyllis (Gailmarie Haller) tries to get comfortable with her back pain while Uncle Phil (Bill Hitt), Sis (Alexa Laur) and Mom (Karen McKinney) try to comfort her. But as Don’s mission takes him on a circuitous route, meeting a variety of humanity along the way, he begins to understand his father – and himself – a lot more. Mike Owens is featured as Don, who appears as narrator as well as in scenes on his present journey to scatter his dad’s ashes, and as a youngster on family trips of long ago. It is a lot of acting territory to cover, but Owens is up to the challenge. In the present, he is the accomplished writer, becoming indignant by the roadblocks he’s encountering on his journey – with his dad’s ashes in the urn. In the past, he’s a kid, droning “Mo-om” endlessly to get her attention during the din of a family argument or wind-milling his arms at his sister, a near constant source of irritation, in adolescent combat. I’ve seen Owens in several shows recently, and am so impressed by the energy and fine, distinct characterizations he brings to area stages. I also enjoyed Mallmann as Dad Browning. I remember seeing him years ago in small roles; his roles have increased in size and scope through the years. This is his best performance to date. He gives Dad just the right amount of enthusiasm as he spots an educational opportunity on trips, occasional bursts of anger when the kids just won’t behave and hilarious observations on the road with his subtle delivery. He really nails the scene in which Don calls to say he won’t be at his retirement party, his voice and demeanor clearly showing his disappointment, verging on anger. Laur’s character is also a delight, playing the perfect sister instigator in the car and getting just the right child-like intonations to make those scenes resonate. Keeping the family together like glue is Mom, played by McKinney. Just as in her turn in “Miss Holmes,” McKinney shows here that she knows her way around comedy. One of the funniest scenes in the show is Mom’s stint at the wheel as she attempts to pass an RV. McKinney’s steel-eyed determination, mixed with pique at her husband’s interference and kids’ suggestions, are so much fun to watch. Bill Hitt, Nick Marzinski, Robin Stein and Gailmarie Haller also do a nice job playing various characters on the family’s travels. I especially enjoyed Hitt in his roles, giving each a humorous edge. He and Haller’s Amish couple selling their wares really hit a funny bone. Haller, perhaps, could have ratcheted down her antics a bit as Aunt Phyllis. Sound designer Tom Matasek had his hands full with a variety of sound effects, mostly pertaining to car travel – tires screeching, engines turning over, the sound of whizzing by a billboard – which added nicely to the show. A large screen above the stage on the side adds realistic scenes of vacation sights that bring the audience along for the ride.